There have been quite a few of you asking questions about T-Mobile’s new Wi-Fi unlimited calling feature and how it might affect international usage and roaming. We’ve managed to get a hold of the above screen shot which nails down exactly what the conditions are for international usage and how such calls are billed. As of 5/13 Wi-Fi calls placed on Wi-Fi calling compatible handsets are no longer charged minutes so long as the customer is an Even More or Even More plus postpaid rate plan. Since this screenshot is dated May 23rd and therefore after the new rate plans have launched we’ll take a guess and say this is also available on those rate plans as well. ← T-Mobile’s Web Only After Hour Sale Is on! What if I had a prepaid phone or if I ran out of minutes? Vague question. I’m pretty sure prepaid phones don’t have UMA capabilities. UMA is available only on BlackBerry devices, most of the Android phones, the Astound and the Mode from Nokia. You would also need to have the feature on your rate plan otherwise it will still bill as whenever minutes. I don’t believe this feature is available to Prepaid customers. Android phones are indeed available on pre-paid (like the Comet) and in any case you can plug a pre-paid SIM into virtually any phone T-Mobile sells. So you have a prepaid and you’re on a device with UMA/Wi-Fi calling? Then you can’t make international calls (as per usual) but you could still make a Wi-Fi call from another country – while on a Wi-Fi network of course (roaming not allowed on prepaid AFAIK). 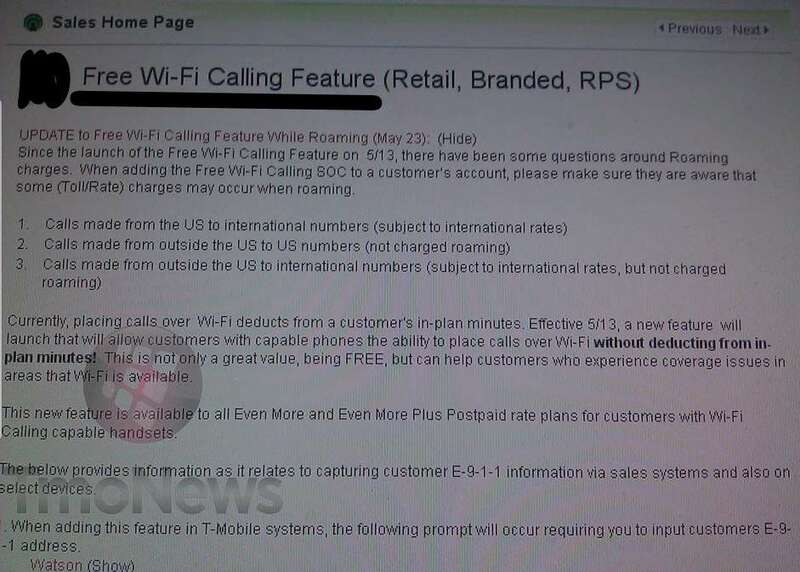 Basically, bullet point 2 from the screenshot above applies to a prepaid phone with Wi-Fi. If you run out of minutes, well…. you’d run out of minutes. Prepaid doesn’t get free calling, it comes out of the minutes you’ve paid for. DAVID THERE’S AN EXCEPTION: IF THE CUSTOMER HAS INTERNATIONAL TALK & TEXT ON THEIR USA PLAN, WHEN THEY GO OVERSEAS HAVE THE WIFI CALLING SOC ON THEIR ACCOUNT, HAVE DATA ROAMING OFF, THEY CAN CALL SAY… SPAIN LANDLINE AND THE CALL WILL BE FREE BC SPAIN IS ON THE LIST OF FREE #S TO LANDLINES. Calls made from outside the US to US numbers are NOT charged roaming meaning no international rates as well? it would be like US to US call? Consider it like this if you will. If you are connected to a wifi router and you have the UMA feature and your UMA is turned on, it will be seen the same as if you were standing next to a T-Mobile tower here in the States. For those on grandfathered rate plans, Family Time and Get More, this feature is available as well. The feature is called ‘HS@Home UL Promo’ that was launced when the T-Mobile @ Home phone service was imtroduced. Many reps are not aware of it. You may need a supervisor to add it or you may need to extend your contract. You can tell the rep the SOC code to help them out, which is UMAUFTSP. Hope that helps some people out. It is too bad there isn’t some kind of work around for those of us with grandfathered plans so we can get the free wifi calling added on. I have 2 G2’s and use the wifi calling feature in my home because of poor signal strength. And it works well just like it is suppose to. Is it some kind of programming thing is why grandfathered plans can’t get it? Kinda stinks!! If you can’t get the free version added onto your account or you don’t want to extend your contract, you can add the ‘Unlimited HotSpot Calling’ or ‘Unlimited HotSpot Calling for Families,’ depending if you are on an individual or family plan, respectively. This feature is $9.99 per month for both individual and family plans and covers everyone on a family plan if you have the feature added to a family account. Hope that helps. I just had this added last week. The key is to be nice to the rep. Just tell the rep that newer rate plans qualify and so should people on older rate plans. If it works, great. I had to extend my contract for a year but that is worth it since I travel to Canada once a week. Helps on my minutes. I have always had great relations when I call T-Mo customer care. They always seem to go out of their way to investigate my problem or concern. Hopefully AT&T will keep T-Mo customer care! Just hoping! I just was in Germany for a week and used wifi calling on my G2. SOME ONE HAVE A INTERNET CONECTION PROBLE IN ARLINGTON TX ?? OR IS ONLY ME ?? Someone needs a CR-48. No caps button FTW. So I have trip to Europe coming up in August and we are on a grandfathered family plan. She has the Vibrant with Wifi Calling and I will have the Sensation. If I understand correctly, I can turn our radio/data off and solely use Wifi for calling back to the US and ONLY be charged for the regular minutes being used? If so, that’s great news. I was planning on paying for Skype for the month and accomplishing the same thing, but one less layer would be great. Also, if we have our data turned off, but WIFI on, can we still get e-mails and text messages? You will be able to use the wifi for the calling and the web browsing and it will go towards your minutes depending on what time you call locally. The web browsing is on the wifi and will not be considered roaming nor count towards your alloted data plan. Just be sure to have your phones off when not connected to wifi to avoid any potential international roaming charges. You can visit http://www.t-mobile.com/International/RoamingOverview.aspx?tp=Inl_Tab_RoamWorldwide to get the rates for international roaming. Remember: if you leave your phone on and ignore calls, you just made a 1 minute call while you’re roaming internationally. 2 responses, 2 different answers regarding texts. Gotta love it. I’m waiting for my answer to go through… it’s a long reply so I think the comment has to be approved. Basically, yes, you can use SMS and MMS over Wi-Fi in another country. Email, naturally, always works over Wi-Fi. There is proof of this in T-Mobile’s documentation as well as proof by users in the official T-Mobile forums who have done this themselves. I have links for proof in my comment when it gets posted. Texting: when connected to wifi, it acts as it normally would stateside. When not connected to wifi roaming internationally you will be charged $.20 – $.35 per message SENT (depending on country) in addition to coming out of your monthly text plan. Received texts will count towards your text plan only or will be $.20 if you have no text plan. Thanks Matt and Not ice_fusion. So would you recommend turning airplane mode on and then wifi on? That way I can’t get screwed into any data charges and will only have connection via wifi? another solid option is to use the ability to turn off background data and data roaming. I have the G2 and am interested in using the WiFi calling feature (haven’t gotten around to setting it up). Right now, if I place a call using WiFi, will it deduct the minutes from my plan, or am I automatically enrolled in the unlimited WiFi calling feature? Is this unlimited WiFi feature something I have to call into customer care to add to my account? You are not automatically enrolled in the feature. You can add it on using your device through the my account app , on your my.t-mobile .com, through the automated system or by calling a rep. As it stands without the feature all calls made through the wifi calling app will bill towards your monthly allotment. I don’t believe this can be added through my.T-Mobile.com? Can anyone confirm? I was looking through the services on T-mobile.com and this wasn’t listed. I called 611 and talked to a customer service rep and she said that I don’t need to enroll in this and that its automatically turned on. However, I turned on WiFi calling and it says that it uses plan minutes. It might just say that because it’s coded to say that. I am not sure 100% myself if there is anything to be enrolled in since that CSR didn’t know very much about this. I recently made a call to Florence, Italy with Google voice and the charge was 10cents for 5 minutes. That along with wifi calling might work ok. I also figured I’d just get a sim from a local provider. Crap I wished I wud of done that when I went to mexico.. when I took my g2x to Mexico for the first time I activated international roaming at da store and they didn’t tell me anything about this. All the girl at the T-Mobile store told me when your roaming in Mexico its $1.99 the minute to make a call. So watever I still took my phone I went by car to Tijuana once I crossed the border into tijuana my phone switched to “telcel GSM ” everything worked fine calling, txting,internet. Even tho I only got an edge signal. My boyfriend on the other hand was also roaming on telcel on his att atrix only difference he had an H+ icon. So we got to the airport to catch our plane to Mexico city once we got to Mexico city same thing we were both roaming on telcel I had an edge icon he had an H+ icon. We both made a few calls to family members back in the states. We still haven’t gotten our bills, I’m.scared cuz I’m pretty sure I will be getting a huge T-Mobile bill and he will be getting a huge att bill. So, because it worked you think it’s free? No dumazz why do u think I wrote at the end that I’m scared of how much my bill is gonna be? Because I know they charged for roaming and I used my phone a lot. So its my fault I know. I think the “dumbazz” here is the one that can’t use proper English. But seriously, you should have gotten a Telcel SIM card and not worry about your Tmo bill. The only reason I spelled dumbazz like that its because if I spell it the correct way my comment doesn’t get posted, I know because it has happened to me before. Anyways yes you are correct in that I should of bought a telcel sim card. this is awesome, I’m glad that this is being done, just one more reason they are the value leader. I guess with unlimited minutes on an EM+ plan, it doesn’t much matter whether I activate this or not. Or am I missing something? If you travel overseas, it’s invaluable. I’ve been in Pakistan for a couple months now and can take and make calls to anyone back home as long as I have wifi. Can HD2 running on Android get on this wifi calling? If so, how? I have an EM+ plan, but i believe it is prepaid/flexpay. I know they are gone, but could i get it changed to a postpaid account? I would love to have this feature. I was on a EM+ plan on FlexPay before going postpaid. After a minimum of 6 months good payment history (As in on the due date or before, not the last day of the billing cycle), yes. Other factors that can help is having Easy Pay set up. You can check to see if you’re on the eligibility list for Post every 1st on the month. You have to get it added to your Plan. If the customer service rep doesn’t know, you will need to educate him/her. I added WiFi calling a few days ago and the rep also said that it wasn’t needed. But, he actually made sure and looked and found the feature. He added it, they need to verify your address (for 911), and that’s it. beware of T-Mobile! They will always find the way to rip you off! Right, tell that to ATT and Verzion customer. if you make calls from US to overseas using WIFI UMA, Do you get charged? Seems like a rip off. When in Europe I use talkatone linked to my google voice number. Calling to the U.S. is free with no sly international charges.